Connect: behind the front-end experience is an extraordinary frontend engineering knowledge drop from Stripe’s design team — how they built engaging landing pages with next-generation technologies like CSS 3D, CSS Grid, and the Web Animations API — including the (new to me) Intersection Observer API to detect the visibility of an element. A must-read. Testing this plugin to improve responsive image support for WordPress is a great way for front-end designers and developers to get involved in core WordPress, modernizing the platform that powers almost 25% of the web. Via WordPress › Update: Responsive Image Support for Core « Make WordPress Core. This is so awesome—you can now generate your WordPress starter theme based on _s with one click: Underscores.me — The Best Way To Get Started With The _s Theme. Matt Wiebe linked up a piece of required CSS reading from Nicholas Gallagher. I recently attended the excellent Web with Molly workshop held in Tucson, Arizona (February 2012). The overall topic was the Open Web. Understanding its history, key technologies, and important concepts. Molly presented over two full days, with interludes and additions by special guest Kimberly Blessing (who also took photos). Even considering myself an industry veteran—I’ve worked full-time on the web for over seven years, I learned new things and solidified several of my weak areas. I highly recommend this workshop to anyone who works on the web. And, Molly organized the weekend on her on time—and her own dime. Thanks Mols! Here are my notes from the sessions. Preserving the infrastructure of the web so it remains open to everyone. There is a lot of excitement right now in the Tucson web design and development scene. Tucson Digital Arts Community is rocking the house with monthly workshops, local companies like Bookmans are innovating with their agile web development and engaging user-centric website, and there is a buzz of energy around getting together, sharing ideas and best practices, learning, networking, and improving our community. Local web ninja Jared McFarland summed it up nicely in Capitalizing on the Tucson Tech Community. We, as a community, can work together to educate and inspire one another. We can enjoy the same benefits as the people in major tech centers simply by knowing each other and inventing ways to work together. It isn’t about vast numbers of people, but small passionate groups. The web brings like minds together globally, but we can now use the web to find each other and act locally. We can turn Tucson into something intentional, and beautiful, for ourselves and the city. The larger Tucson community is also bubbling with social events like Ignite Tucson and the myriad of Twitter meetups (“Tweetups”). Just search Twitter for #tweetup #tucson to be amazed. These events cover a much broader range of topics than web design and development but they all share a common goal: to mingle, network, and share with others. This is how I think it breaks down: socially, the larger community wants to meet itself and technologically, web designers and developers are joining together to improve the tech community. All of this energy and enthusiasm is contagious! In contrast, I want to share the story of the Tucson Geek Meet1, a group I was personally involved with for four years. Started as the Tucson Web Standards Group in 2003 by Molly Holzschlag, the Geek Meet slowly lost momentum over time. Instead of growing and expanding, it stayed a small core of five or six people. Don’t get me wrong, because of those meetups the five or six of us are now steadfast friends, and several of us have had the opportunity to work together. Now that we are friends we can socialize anytime—we don’t need to call it anything. The idea of the Geek Meet isn’t going away, it’s just being replaced by ad hoc Tweetups and other social happenings around town. What I want to encourage, and I think Jared hit on this, is not just the social aspects of meeting together but the educational and inspirational benefits of sharing code, experiences, and real-life examples of our work. TDAC is spearheading the effort by organizing workshops and collaborative coding days to get people together to educate, inspire, network, and improve. I’ve been a part of TDAC for six months now, and the tech community in Tucson isn’t just soaking it up, it’s clamoring for more. We’re hoping soon to have a Refresh Tucson—our neighbors in The Valley have had a strong Refresh presence for three years—we can do the same here in the Old Pueblo. So please participate: join up, tweet up, meet up, share, and pass the word to your colleagues and friends. Search Twitter for #tweetup #tucson and come join the fun. Are you on Meetup.com? Tell your Meetup.com cronies to join the fine sites listed above, especially if you are on the Meetup.com Web Standards “waiting list”. Wait no more! 1 The Tucson Geek Meet is no more, it’s pushing up the daisies, it’s kicked the bucket. This meetup is not pining for the fjords, it’s gone to meet it’s maker. It’s… OK, enough of the Monty Python! 2003(? ): Started by Molly Holzschlag. 2005: Tucson Web Standards Meetup moved to Upcoming by Lance (from Meetup.com). We met at B-Line and Famous Sam’s. See Molly’s 2005 post and my 2005 post as well as the Upcoming group page. 2006: Met monthly at the Old Chicago patio. A few Flickr photos from 2006 events: Great Discussion at Tucson Web Standards Meeting, Geoff in Action. 2007: Changed the name to Geek Meet. 2009: Called it quits in favor of other local groups and Twitter meetups. This post was originally titled “Rest in Peace, Tucson Geek Meet” but I decided that it was just a small part of the burgeoning Tucson web design and development scene. If you are passionate about a cause, preach it loudly and clearly, and see it as the best way to do things, you are labeled a zealot. If you keep your head down and stay out of the shouting matches, often ignoring them simply because you don’t have the time or energy, you are labeled as complacent. The middle ground, if there is one, is to be pragmatic. Embrace standards and strive to meet them as much as possible, but know when to give in and just get the job done. Or better yet, build something the right way, and lead by example. I’m ashamed it’s taken me all these years to come to this realization, but hey—better late than never. Update: Summit Hut did some redesigning this week, including a new logo, new color scheme, and some layout changes. I was not involved in these updates. Please see the screenshots below and on Flickr for a reference to the the site design before these changes. From the Recent Client Projects and I Should Have Blogged This Months Ago departments, I present a brief report on a website realign for Summit Hut. I was fortunate to work with my great friend and mentor Aaron and several former coworkers from my days at the Hut (I worked there 2001–2005). The subject matter was close to my heart, and having worked on the website for a short period of time before leaving the company, I was thrilled to help with the task of realigning and recoding Summit Hut’s flagship website. View screenshots, visit the live site, or for more details on the part I played in the realign, continue reading. Disclaimer: Please note, I am not involved in the upkeep and production of code or graphics for Summit Hut; my role was to build a solid foundation for future development and visual merchandising. I did produce the first home page graphic (view screenshot), but the home page graphics and various and sundry sidebar callouts throughout the site have changed since the site launch in February 2008. I was in charge of visual look-and-feel, basic interaction design, and coding the HTML and CSS for the page templates. My goal was to create a mood that was simple, clean, and sophisticated with a subtle regional feel for Summit Hut’s location in the Southwest. The visual tone took cues from Summit Hut’s in-store merchandising and signage. The chosen color palette, typography, and imagery were all tailored to match the wonderful feeling one gets when stepping into the company’s high-end retail shops. I intended visual chrome such as icons and buttons to produce a clean and professional look to match the company identity as a premier outdoor retailer. Considerations included better readability, clearer navigation, enhancements to the display of vendor brands and product images, and improved product merchandising. Merchandising an online store can be quite challenging, especially if you want to reflect how the real-life store works. There are really two parts to it: decorative and organizational. The first is extremely important since it conveys value and desirability to the products; the second provides a clear arrangement for easy searching, browsing, and choosing. My goal here was to remove obstacles and let customers figure things out easily while providing a pleasant, easy, and fun shopping experience. The recoded page templates were probably the most urgent need; the former summithut.com sported a table-based layout, spacer GIFs, and other typical markup-cluttering artifacts. Valid XHTML and CSS to the rescue! Building on Aaron’s solid programming and site framework, we worked together on producing lightweight and reusable HTML chunks (by reusable chunks I mean in the spirit of microformats). For the style sheets (CSS) I used principles of grid-based layouts and the excellent Blueprint CSS framework as a starting point for resetting and standardizing the layout, text treatment, and interaction messages. All the benefits of standards-based development apply to the updated pages: faster loading times, code that is easier to read and update, improved usability and accessibility for traditional and non-traditional devices, as well as flexibility for future website features and visual changes. Interactive design tasks for the realigned site centered on product browsing, selection, and the checkout process. For purposes of keeping this report as brief as I can, let’s take the example of the product browsing and navigation. The previous product navigation involved a clunky accordion-style navigation on the left of every page. The new site splits the top-level navigation into a horizontal dropdown menu on every page, improves the search tool, and provides multiple ways to visually scroll through products. Product browsing can be in a list view or thumb view, and the sidebar menus allow you to drill down and refine the offerings easily. 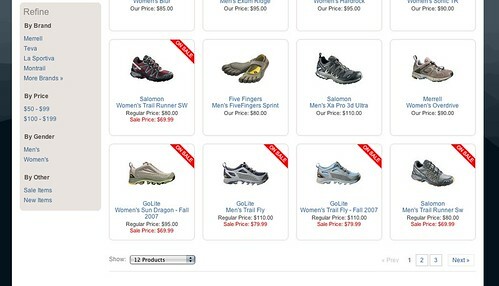 The dropdown navigation for products was an important piece of this realign (view screenshot). 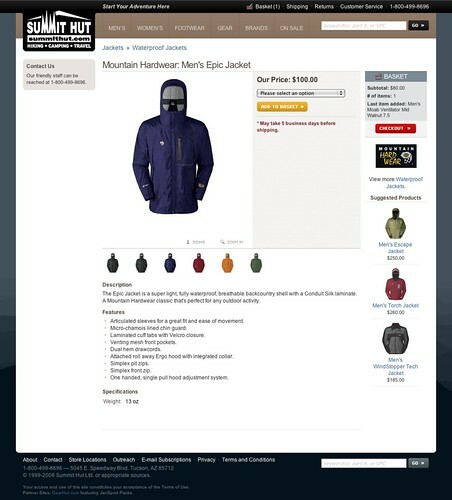 The amount of products and product categories in Summit Hut’s online store makes the product navigation interaction a complex and difficult one. The information architecture is based on the store’s internal organization, which doesn’t always mimic how customers shop. The dropdowns provided a great way to simplify the complexity, and with Aaron’s excellent choice of jQuery (with the Superfish plugin), this interaction works wonderfully. There were many, many, more improvements to Summit Hut website; I can’t list them all here, but you can view the old site on archive.org and then browse the current site to see for yourself. In URLs Can Be Beautiful, Chris Shiflett explains how he built beautiful URLs for OmniTI. I agree whole-heartedly that URLs can and should be beautiful, and I firmly believe they should not only look good, but should also be useful, meaningful, and “discoverable.” In the case of OmniTI, the first subcategory in the URL is based on an action verb, like “is”, “helps”, or “thinks.” This gives the URL a powerful mnemonic quality, since it reads like a sentence. It also describes the content of the page it represents, which is awesome. The only downside I can see is the “discoverability” for common URLs like “about” and “contact”. A lot of people are used to finding those URLs the same on most sites, especially typical brochure-type business websites. But, you can always have a redirect rule for those if it’s important. The creativity and unique design of OmniTI’s URL scheme might just make up for the loss of predictability. I’m glad to see a great example of a beautiful and semantic URL scheme to use as inspiration for my own projects. UPDATE: As a nice follow-up, Nate Abele explains how to set up nice URLs in the CakePHP framework by defining custom routes: Advanced URL Routing and SEO Techniques with CakePHP. Can you refer me to a tutorial for making CSS-based dropdown menus similar to what’s found on this site? First of all, I must admit I am not a big fan of dropdown menus. They can be a usability nightmare when not done right, and all too often they mask a poorly developed site architecture. That said, if you feel the need to incorporate them for your site (or a client insists you do it on their site), there is a right and a wrong way to it. The cthsu.com site uses a product called “CSS Express Drop-Down Menus” from ProjectSeven. It’s another good implementation aimed specially at single-level CSS dropdown menus. Drop-Down Menus – Good or Bad? Dropdown menus. Use them or lose them?